Selling as LOT 34 ready to FLUSH conventional or IVF.... Peak Hibiscus a +2813G Altaflywheel daughter backed by Swampy Hollow Hope! Take Hibiscus home and put her to work! The opportunities are endless when you invest in great genetics and buy embryos from the outstanding members of Holstein Plaza. Yesterday we were notified from a happy customer that purchased five Modesty embryos from S-S-I Supst Shayna 11284 resulting in four pregnancies - three heifers and one bull. Preliminary results on the heifer came back at +2882 GTPI and +2801 GTPI on the bull. Congratulations to the buyer and the breeder on the tremendous mating. For your next chart-topper check out the Holstein Plaza Online Embryo Auction. Farnear-TBR-BH Georgia has increased her score to VG-87-2YR with a VG-87-MS! Georgia is a GTPI+2479 McCutchen daughter backed by a deep pedigree, she combines her high GTPI with nearly 3 points on Type! The #2 GTPI *RC/Red cow in the breed (8/15) in the US, Sassy is a maternal sister to Sympatico and is the dam to the #6 Red Heifer in the US. CLICK HERE to read or to VOTE for Sassy as your favorite Epic daughter! Two exciting Mogul daughters at Speek-NJ have recenlty been pictured. Sandy-Valley Mgl Biscuit is a VG-85-2YR Mogul daughter backed by the Barbie family and Amaretto VG-87-2YR goes back to the same cow family as Rubicon and Charistmatic! Both Mogul daughters have embryos selling in the Online Embryo Auction. CLICK HERE to see the pictures. The new Top 25 GTPI Red Females in the USA has been posted. The new #1 GTPI Red Female is Ms DG-TM Brandy-Red a GTPI+2489 Debutant daughter of Calbrett Supersire Barb *RC. The offspring of Des-Y-Gen Planet Silk ranks extremely well, she has no less then 5 grand daughters in the Top 25 Red Females. The Holstein Plaza 24/7 Webshop offers several opportunities to start your own branch of this fantastic transmitting family, CLICK HERE for a link to the webshop. CLICK HERE for the Top 25 Red Females in the USA. Selling as Lot G8 in the Question for Success Sale II is an EARLY exciting Commander daughter form De-Su 410 VG-85-3YR. Speek-NJ Commander Mazda scores GTPI+2578 and is the #2 UDC (+2.89) and #3 PTAT (+3.05T) Commander daughter and she combines a high production index PTAM+1491, PTAP+58 with an excellent DPR (+2.3). Mazda is the maternal brother to De-Su Mgl Jennings 11400 GTPI+2571. Speek-NJ Holsteins consigned some exciting lots to the Destination Vegas Sale and the Fun in the Sun Sale, which both take place tomorrow. Selling as Lot 22 in the Destination Vegas Sale is Josey-LLLC Oly Subaru-Red GTPI+2497, Subaru is the #3 GTPI Red Heifer in the Breed! Also selling in the Holstein Plaza Online Heifer Sale from the Planet Silk family are Dymentholm Sunview Sassy *RC VG-85-2YR, the #1 GTPI RC Cow in the Breed and #11 Milking Female in the Breed and one of the highest Red Heifers in North America Josey-LLC Smurf-Red! The Holstein Plaza Online Heifer Sale runs trough Thursday December 18. Great Classification for Silk Daughters! Speek-NJ Holsteins had earlier this week a tremendous classification day with several Des-Y-Gen Planet Silk EX-90 92-MS daughters scoring Very Good! Dymentholm Sunview Sassy *RC scored VG-85-2yr and she is one of the highest Red Carrier Females in the Breed scoring GTPI+2403! Dymentholm Sunview Skye scored VG-85-2yr with Excellent F&L! Her Tango daughter scores GTPI+2559! Dymentholm Sun Siren-Red scored VG-85, her GTPI+2335 NM$+811 Red Carrier Jabir *RC sells in the Holstein Plaza Online Heifer Sale starting tomorrow! Also selling in the Online Heifer Sale is a GTPI+2329 NM$+816 Red Carrier Jabir daughter directly out of Planet Silk! Dymentholm Sunview Sunday *RC VG-87-2YR is the new RC #1 GTPI cow on the locator list. Sunday is a Snowman daughter of Des-Y-Gen Planet Silk EX-90 and the full sister to Sympatico *RC. Her *RC Cashcoin son Mr Sunview Sunfish *RC (GTPI+2389 GRZG+156) will be released soon, he is the #1 GRZG RC bull in the German system. 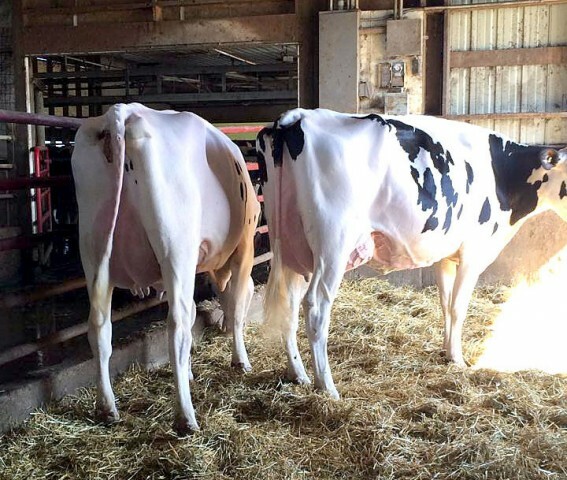 Recently two daughters of Des-Y-Gen Planet Silk *RC EX-90 92-MS have been pictured. 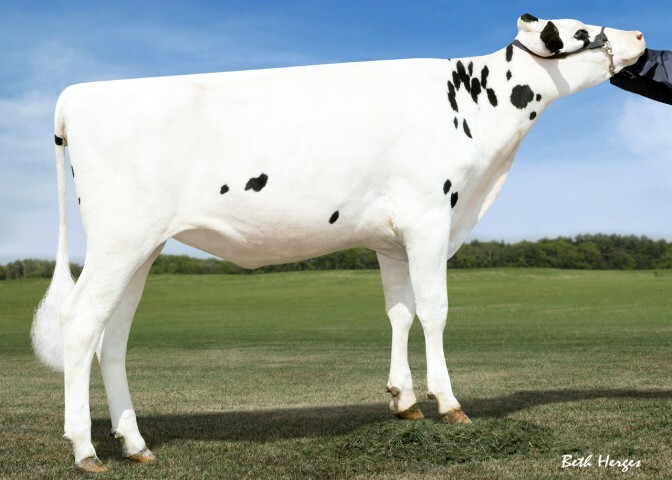 Dymentholm Sunview Sunday *RC is a VG-87-2YR Snowman daughter out of Silk and the full sister to the popular young sire Sympatico *RC, Dymentholm Sunview Skye is a GP-83-2YR Sudan daughter from Silk, she is the full sister to the sire of sons Seneca *RC and has already 11 daughters over +2300G including a Tango at +2558G! Des-Y-Gen Planet Silk daughters continue to calve in with exceptional udders and style! Pictured here are Dymentholm Sunview Scoby *RC (Epic x Silk) VG-85-2YR with a GTPI of +2189 and Dymentholm Sunview Sunday *RC (Snowman x Sunday) VG-87-2YR with a GTPI of +2256. Two of the top Red/RC cows in the breed and will be flushed ... watch Holstein Plaza Auctions for opportunities from these two fantastic Silk daughters and other maternal sisters! New Scores for Silk Daughters! 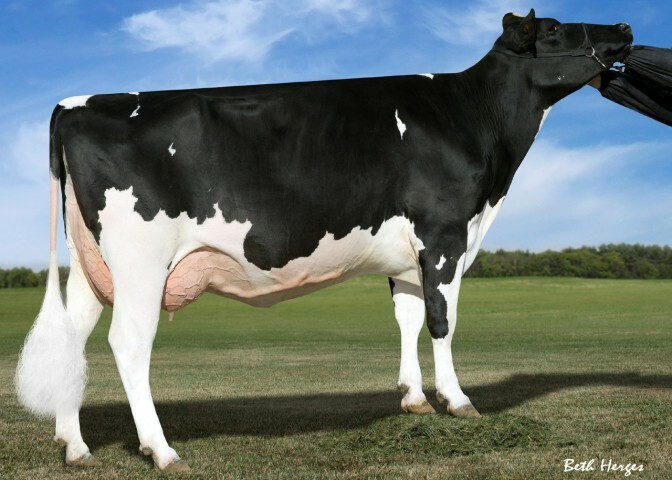 Several daughters of the famous Des-Y-Gen Planet Silk EX-90 were scored yesterday with fantastic results. 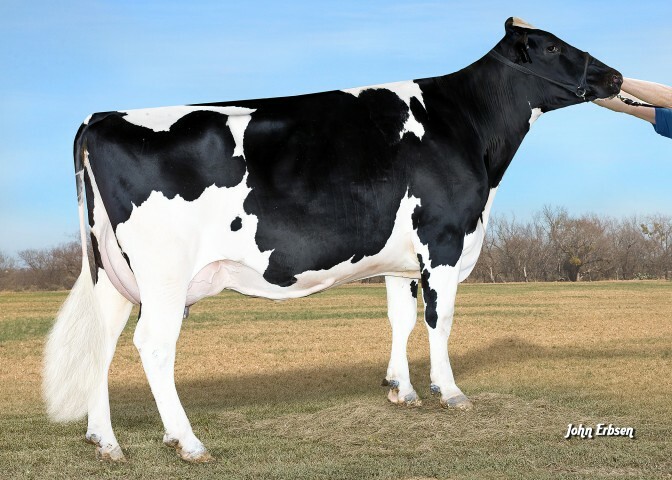 Dymentholm Sunview Sunday *RC (Snowman x Silk), the full sister to Symapatico is now Very Good-87-2YR 88-MS. Sunday is now owned by Speek-NJ Holsteins sold privately by Sunview Holsteins. And receiving their first score just fresh were Dymentholm Sunview Scoby *RC (Epic x Silk) Very Good-85-2YR 85-MS, Dymentholm Sunview Skye (Sudan x Silk) Good Plus-83-2YR and Dymentholm Sunview Shalom *RC (Sudan x Silk) Good Plus-83-2YR. The Peak & Speek-NJ Genomic Opportunity Sale closes today, May 21, 2014 at 4:00 p.m. (EST) with staggering closing times (every one minute). Place your bids now at genomicopportunitysale.com or by contacting one of the sale staff members listed in the catalog. Fifty fantastic lots sell featuring the best of the Peak Program and Speek-NJ Holsteins. Don't miss this fantastic lineup featuring the No. 3 Haplotype Free Tango in the breed sells from the Barbies with a GTPI of +2508. Also selling the +2483G Jacey granddaughter of Planet Silk along with several others over +2400G. There is a tremendous pair of flush/donor cows selling and several flush-age heifers to add an immediate return to your genetic program. The Peak & Speek-NJ Genomic Opportunity Sale is now open for bidding! Fifty fantastic lots sell featuring the best of the Peak Program and Speek-NJ Holsteins. Don't miss this fantastic lineup featuring the No. 3 Haplotype Free Tango in the breed sells from the Barbies with a GTPI of +2508. Also selling the +2483G Jacey granddaughter of Planet Silk along with several others over +2400G. There is a tremendous pair of flush/donor cows selling and several flush-age heifers to add an immediate return to your genetic program. Selling in the Destination Naples Sale as lot 5 is Speek-NJ Predest Crumpet-ET GTPI+2573 GLPI+3413. 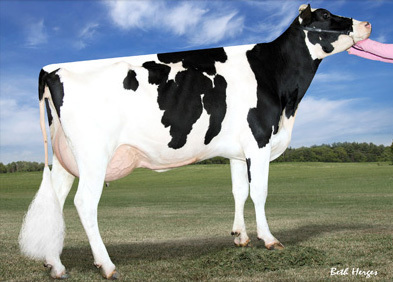 Crumpet is the #1 GTPI Predestine in the Breed (12/13) and is a daughter of Larcrest Credit VG-85-2YR DOM. Unique RED offering direct from Silk! Tremendous opportunity from the now Excellent Des-Y-Gen Planet Silk, EARLY Archive-Red (gRZG+152 / +2171G) embryos sell in the Online Embryo Auction... Silk has already several *RC daughters over GTPI+2400! Click here for more information. New photo of Larcrest Credit, the Very Good-85 Freddie daughter of Planet Comet with a GTPI of +2237G. Credit already has several high testing daughters, watch for something special out of Credit to sell on the Holstein Plaza Online Heifer Sale. 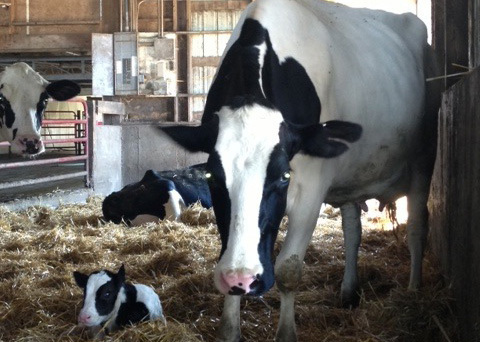 Two donors of the great Cosmopolitan cow family have been re-scored at Speek-NJ Holsteins. Freddie daughter Larcrest Credit is now VG-85 and her dam, Larcrest Comet, is now classified VG-87. Selling in the Online Embryo Auction are two #1 grade Halogen embryos from Larcrest Credit. Tonight at the World Classic Sale a RED Paige daughter of Silk is selling. Josey-LLC Splendor-Red-ET scores GTPI+2297, which makes her one of the highest Red heifers in the World! Her dam Silk is fresh again and looks great. Des-Y-Gen Planet Silk is fresh again and looks amazing. Silk is currently one of the highest *RC GTPI cows in the world. 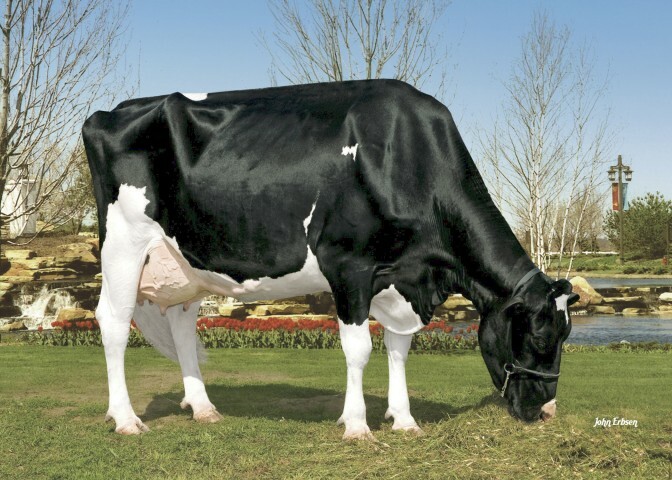 Silk is the dam of the popular sire of sons Seneca *RC at Genervations, Stoic *RC at TAG and Sympatico *RC at Semex. She currenlty has also 4 daughters in the Top 25 GTPI *RC/Red. 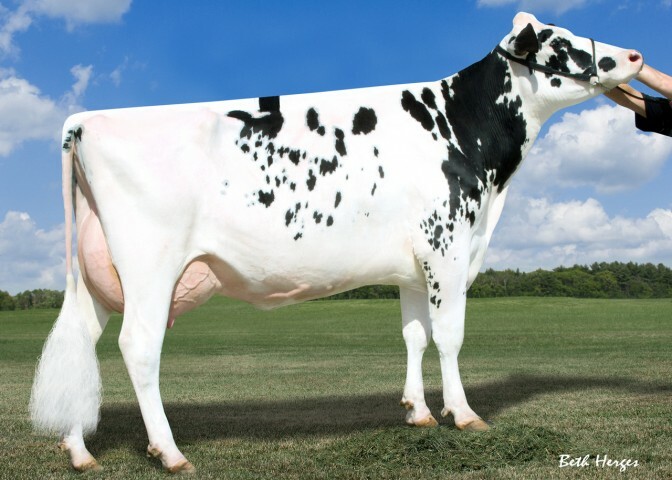 Early SENECA *RC Embryos are selling in the Holstein Plaza Online Embryo Auction from an EARLY *RC Numero Uno daugther of Scientific Gold Demi Rae, 2nd dam is Scientific Debutante Rae EX-92. SENECA is one of the most popular sire of sons in many Red & White breeding programs. He is a GTPI+2239 RC Sudan son from Des-Y-Gen Planet Silk. This are his fist embryos in the Holstein Plaza Online Embryo Auction. Larcrest Comet a genetic giant! Larcrest Comet VG-85 is proving herself as a genetic giant. Comet already has 27 daughters with an GTPI higher then 2300! This makes Comet one of the best brood cows of the moment. Selling in the Holstein Plaza Online Embryo Auction are her Female IVF Balisto Embryos. 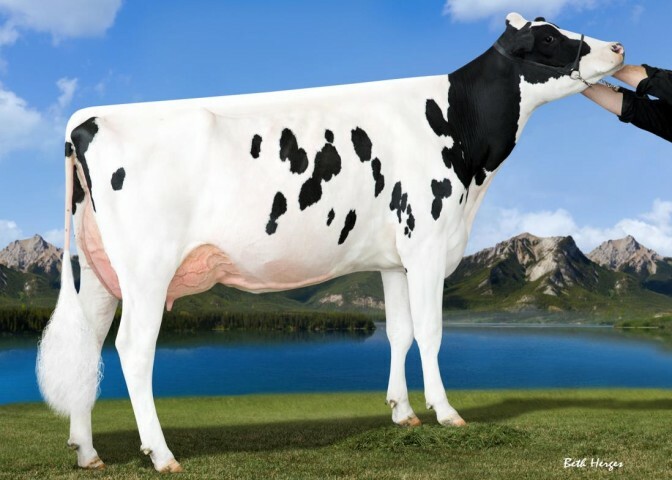 Balisto GTPI+2414 is the #1 sire in Germany for RZG+167. Larcrest Comet has recently been re-scored. She is now Very Good-85. Her GTPI+2352 Numero Uno daughter Speek-NJ Uno Glenn Close will sell at the National Convention Sale. Des-Y-Gen Planet Silk jumped +479 GLPI points on the April 2013 run with a GLPI of +2779 and a DGV of +2847. Selling on the Holstein Plaza Online Embryo Auction are four #1 grade Dakker *RC embryos from the #2 GTPI *RC female in the world (12/12) Epic Sassy followed by Planet Silk! Selling tomorrow evening, Wednesday, April 3 at the Genomic Giant Sale in Victoriaville, Quebec are four tremendous offerings from Speek-NJ Holsteins! Lot 22: GTPI+2489 Numero Uno from the huge protein Planet Deloria and the Durham Daisy family! Comet's highest Mayfield and Uno daughters sell! Larcrest Comet, the huge producing Planet daughter of Cosmopolitan has two exciting daughters selling tomorrow in the Quest for Success Sale in Marion, WIsconsin! New Daughter Photos and Opportunities from Planet Silk! Check out Des-Y-Gen Planet Silk's donor page for new photos of high testing *RC/Red daughters by Epic, Lobster and Alchemy! AND... don't miss the four #1 grade Dakker *RC embryos selling on the Holstein Plaza Online Embryo Auction from the #2 GTPI *RC/Red female in the world (12/12), Epic Sassy from Silk Planet! Also selling on Friday in the Quest for Success Sale in Marion, Wisconsin is Dymentholm Sunview Secret-Red-ET the April 2012 Alchemy daughter of Silk with a GTPI of +2208! Josey LLC Uno Sangaria-ET, the *RC Numero Uno daughter from Planet Silk has a GTPI of +2437G PTAT+3.65 after the March run. Selling from this huge producing *RC outcross family are early opportunites from Sangaria's high *RC Sudan and Epic sisters... click here for more details. Larcrest Comet-ETS had a great day yesterday with her Day daughter coming back at +2475 GTPI with a DGV of 3577 and Conf+16. 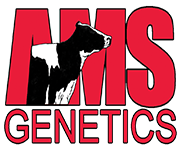 Selling in the Holstein Plaza Online Embryo Auction is an exclusive opportunity to buy FEMALE IVF Willpower embryos direct from genomic giant producing Larcrest Comet-ETS, full sister to O-Cosmopolitan and maternal sister to Crimson. Click here for more details! Des-Y-Gen Planet Silk-ET *RC the Very Good-87 Planet daughter of Gen-I-Beq Bolton Silence-ET *RC and the No. 1 *RC/Red Cow on the Locator List has been nominated Global Red Impact Cow of the Year! Silk's daughter by Epic, Dymentholm Sunview Sassy-ET *RC was the No. 2 GTPI *RC/Red Female in the World (12/12) and has embryos by Dakker *RC selling in the Holstein Plaza Online Embryo Auction - click here for more details. Also selling from Silk's +2117 GTPI *RC Sudan daughter are embryos by Liquid Gold... click here for more details on this outcross offering. Des-Y-Gen Planet Silk-ET *RC the Very Good-87 Planet daughter of Gen-I-Beq Bolton Silence-ET *RC is the NEW #1 *RC/Red Cow on the Locator List. Click here for a full listing of the Top 25. Selling on Monday at the Hartford Genomic Extravaganza Sale is a *RC *PO Colt P daughter from the EX-91 Shottle Deluxe Rae with a GTPI+1983 and +3.13T. Also selling as Lot 50 is a *RC Epic from the tremendous Planet Silk, Dymentholm Sunview Shar-ET *RC. Shar has a GTPI of +2259 +661NM$ +2.62T and sells with multiple A.I. contracts and embryo contract at $1300/embryo. 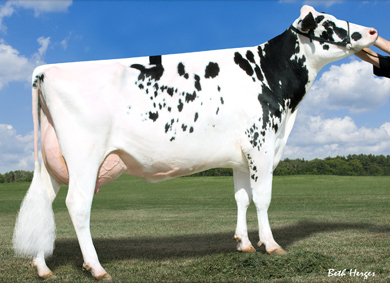 EDG Desire Uno Dellia-ET is the new #1 GTPI female from the October run at +2606 GTPI, +917NM$ and +3.89T. Dellia is a Numero Uno x Atwood x Scientific Deluxe Rae EX-91. Selling from the same maternal line on the Holstein Plaza Online Embryo Auction are 5 #1 Man-O-Shan (#4 Genomic Young Sire) direct from Scientific Deluxe Rae EX-91. Click here for more details! *RC Alchemy from Silk SELLS TONIGHT! Selling tonight in the Central Wisconsin Summer Event Sale is Dymentholm Sunview Sparkler-ET *RC (Lot 29), the +2196G +3.08T Alchemy daughter from the highest GTPI *RC Cow Planet Silk! Also selling from Speek-NJ is a March 2012 Gold Chip (Lot 37) from Deluxe Rae with a GTPI of +2162 and 3.86T! New #1 *RC and Red Female in the Breed! Dymentholm Sunview Sassy-ET *RC is the April 2012 Epic daughter of Des-Y-Gen Planet Silk-ET *RC with a +2442 GTPI and is the new #1 *RC female in the breed! The new #1 RED female is Dymentholm Sunview Soiree-Red-ET with a GTPI+2358 and an Alchemy daughter of Des-Y-Gen Planet Silk-ET *RC. 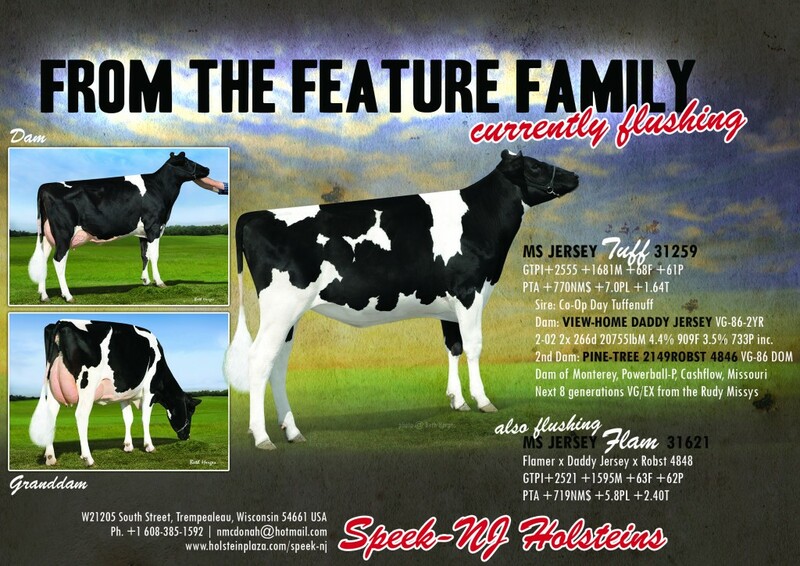 Just in from Speek-NJ Holsteins... Scientific Deluxe Rae is NOW EX-91 91-MS! 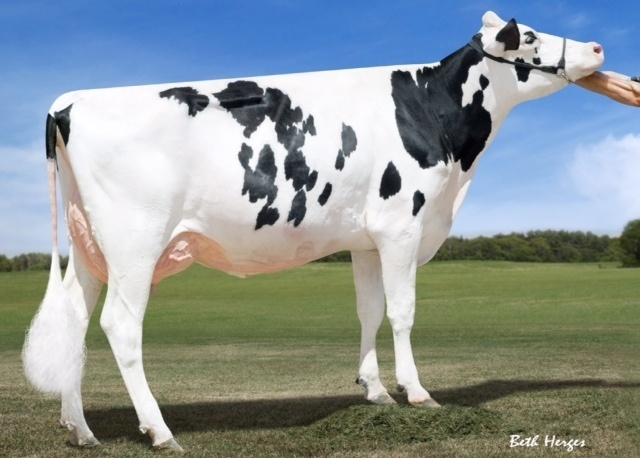 Deluxe Rae is the Shottle daughter of Debutante Rae and has Lithium embryos selling in the Holstein Plaza Online Embryo Auction going on now... Click here for more details! Des-Y-Gen Planet Silk *RC one of the most valuable cows in the breed and one of the highest *RC cows has been purchased by Speek-NJ Holsteins along with a group of her daughters including the #1 Sudan and several high *RC daughters that will be near the top of the charts following the next index run. First Choice from Deluxe Rae! Selling tomorrow on the Regancrest Command Performance Sale is a First Choice offering from the beautiful Deluxe Rae EX-90 EX-MS! Choose from two Planet Yano females born Feb. 2012, five Gold Chip females born March 2012 or a Colt P female born March 2012. Tremendous opportunity from the Debutante Raes! 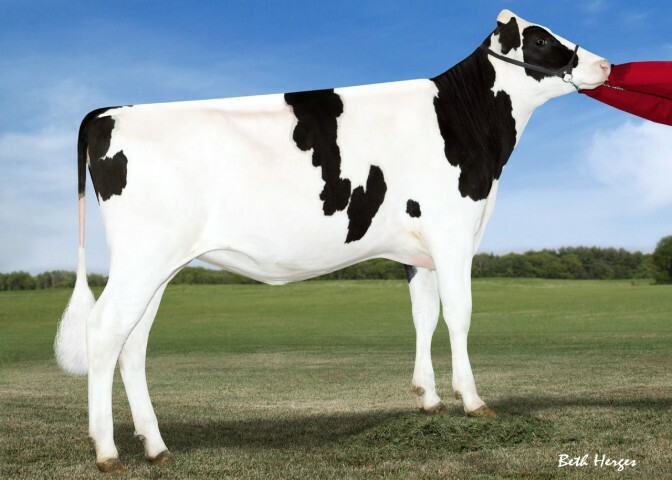 • Nov. 2011 O-Style daughter of Deluxe Rae EX-90 with a GTPI of +2187 and 120 pts over PA! • Domain born Nov. 2011 with +2082 GTPI and backed by seven generations Excellent from the Annabells! 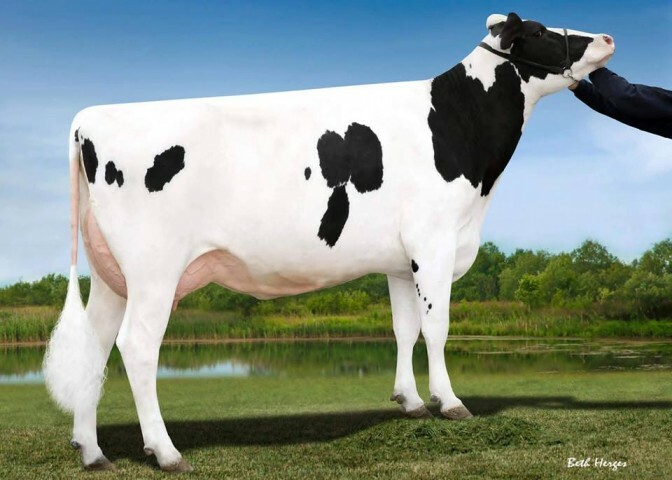 JUST IN... Scientific Deluxe Rae (Shottle x Debutante Rae) just scored EX-90 EX-MS this morning and Henkeseen Lic Ruffle-Red was classified EX-92 (max score). New photo of Scientific Deluxe Rae-ETS the VG-88 *TV Shottlle daughter of Debutante Rae. Four #1 grade Mogul embryos sell from Deluxe Rae... click here for more details! Selling in the Online Embryo Auction ... Five #1 grade FEMALE IVF Mogul embryos from the #7 Protein Cow on the locator list, Planet Deloria VG-86-2YR and from the Durham Daisy family! 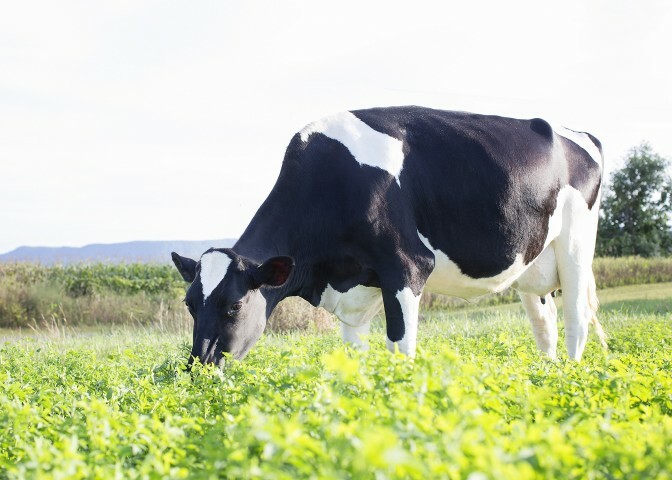 Sells with a guarantee of two pregnancies... if buyer does not get two pregnancies seller will replace the number of embryos from the cow with a maximum of two embryos. Note: Not available for export and sells with a deadline of May 1 for the pregnancy guarantee. Please contact Jennifer with Holstein Plaza if interested in these terms of sale (320-250-2412). For additional details about working with frozen IVF embryos please contact Trans Ova Genetics. 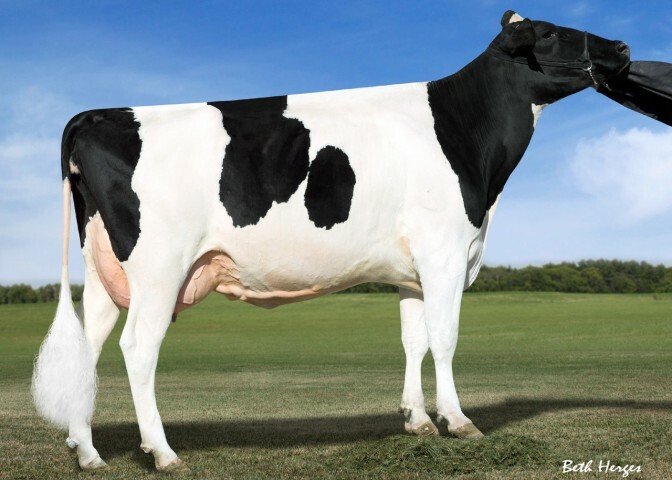 Just added to the January online embryo auction are Five #1 IVF Female Embryos by Mogul (+2552G) from the #7 Protein Cow on the locator list, Planet Deloria VG-86-2YR and from the Durham Daisy family! Click here to check out this fantastic offering. New scores for Speek-NJ Holsteins following a visit from the classifier this morning! Larcrest Comet-ETS, the +2226G Planet daughter of Cosmopolitan is now GP-84-2YR. Regan-ALH Planet Deloria-ET is now VG-86-2YR with 87-MS and is the Planet daughter of A-L-H Destiny. Scientific Deluxe Rae-ETS went VG-88 just 10 days fresh and is a Shottle daughter of the great Debutante Rae. Lots sell from all three of these donors tomorrow... see news item below! Three elite offerings from three tremendous cow families! Selling TOMORROW, Dec. 15 in the Breeders Holiday Classic, West Union, Iowa are three tremendous offerings from Speek-NJ Holsteins. • First Choice MAS x Larcrest Comet-ETS NOW GP-84-2YR, the +2226 GTPI Planet daughter of Cosmopolitan and dam of the #13 GTPI heifer, Comical! • First Choice Alchemy x Regan-ALH Planet Deloria-ET VG-86-2YR 87-MS GTPI+2200 and backed by the Bstar Raven family! • September 2011 Bookems (GTPI+2188 and GTPI+2184) from the VG-88 Shottle daughter of Debutante Rae! 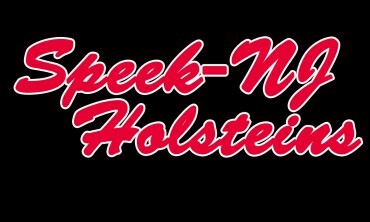 Holstein Plaza welcomes new member Speek-NJ Holsteins online! Check out the high profile line-up of current donors they are working with including a Planet daughter of Cosmopolitan and two Debutante Rae daughters!